Together with department of Radiation therapy of Nizhny Novgorod Oncology Hospital, we have carried out measurements of NO concentration dynamics in the exhaled breath of oncological patients before/after radiation therapy. The studies have demonstrated an increase of NO concentration (in 2-3 times) in exhaled breath of lung cancer patients after a session of radiation therapy. 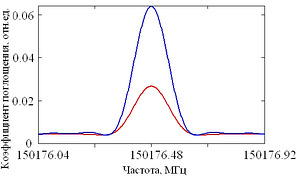 NO absorption lines (f = 150.176 GHz): red line — oncopatient before radiotherapy, blue line — oncopatient after radiotherapy. High-precise spectroscopy with application of microwave resonators is employed for studying a spectrum of DNA (in solutions with water). Fragment of spectra (x axis — frequency, GHz): red curve — water, green curve — DNA in big concentration, blue curve — DNA in small concentration. Registration of vapours, evaporated from a surface during natural decomposition, is a promising way for remote detection of explosives. The THz nonstationary spectrometer has been employed for studying explosives vapours compositions. The investigations of semiconductor coatings growth during epitaxy processes are necessary to understand an influence of deposition conditions on the properties of obtained films. Application of THz gas spectroscopy methods allows monitoring the deposition process (in real time!) in gas phase and plasma.